In the disaster classic The Poseidon Adventure (1972), the ill-fated passengers of a luxury ocean liner must endure a stormy day at sea before the boat is capsized on New Year’s Eve. In the sequel Beyond the Poseidon Adventure (1979) a new cast of characters hop aboard the overturned ship for another round of disaster movie adventure. What it’s all about: Tugboat captain Michael Caine bravely battles the elements as his tiny boat is tossed on the stormy seas of a Hollywood soundstage. His crew includes salty sea dog Karl Malden and comic relief sidekick Sally Field, whom Caine not so affectionately calls “Monkey”. After the storm has passed, they spot the rescue chopper carrying the beleaguered stars from the first film. With the coast guard so far out at sea, Caine ascertains that, “Some ship must be in big trouble.” The salvage rights to a ship the size of the S.S. Poseidon will leave Caine and his crew set for life. He’s overstating the obvious and it only serves to point out the giddy implausibility of the films premise. Even with the pretense of pillaging loot or finding survivors, no one in their right mind would willingly crawl through the wreckage of a sinking ship. But crawl they do, down a vertical hatch that leads them deeper into the ship. An explosion (the first of many) rocks the boat and injures one of the henchmen. While Savalas tends to the wound, a group of survivors are found hiding in the steam room of the ship’s gymnasium. There’s glamour-girl Veronica Hamel, loudmouth Peter Boyle and ship’s nurse Shirley Jones. The group continues onward with the help of a handy deck plan. As the rising seawater rushes in behind them, another explosion rocks the boat. With the camera shaking Star Trek-style, our hapless stars encounter another obstacle, a gaping hole that they each have to leap across. Once everyone has taken their turn at the standing long jump, they find the purser’s office. Another helpful explosion cracks open the ship’s safe. As Caine packs up the cold hard cash, they are joined by southern boozehound Slim Pickens, Boyle’s daughter Angela Cartwright and young hero Mark Harmon. While everyone is otherwise occupied, Hamel slips away with a copy of the ship’s cargo manifest. When she gives the information to Savalas and then plants a wet one on him, it’s obvious that these two are more than partners in crime. Hamel is desperate to find a way out and no longer wants any part of Savalas’ scheme. For her betrayal, he orders her shot. Mortally wounded, she continues to search for a way to the surface. As if this gaggle of all-stars didn’t already have enough to deal with, they’re next joined by blind Jack Warden and his seeing-eye wife Shirley Knight. Crass Boyle suggests that the duo will only slow them down, but Caine insists that they join in the search for a way out. They continue on to the ship’s galley where everyone pauses for a mid-adventure snack. As Caine and Field explore some ductwork, their unlikely romance blossoms. Field indulges in a tearless crying fit. “This is not a good day for me,” she bawls. To get her to shut up, Caine tells her she’s beautiful. While Savalas and his men search the cargo hold, Caine and his group stumble across Hamel, who’s finally expired from her gunshot wound. Caine adds another wacky layer to the proceedings by casting doubt on who could have killed her. In addition to everything else, it seems they have a homicidal maniac to deal with. They continue on to their next obstacle, climbing up a makeshift ladder. Since an inordinate amount of screen time is spent on this relatively simple task, a moment of false jeopardy is added to spice things up. Warden loses his grip and dangles precariously for a few moments. Knight dislocates her shoulder while saving her husband. “It’s gonna hurt a great deal,” Shirley Jones apologizes as she promptly pops it back in place. Everyone finally makes it to the cargo hold where they discover what Savalas so desperately covets. A weapons cache that, believe it or not, includes a crate full of plutonium. “I can’t let you go now,” he sneers. Another well timed explosion gives the good guys enough time to grab some guns and engage in a wild west shootout with Savalas and his goons. Whether it’s wise to fire guns near ammunition stockpiles and weapons grade plutonium seems to be the furthest thing from anybody’s mind. Caine and the rest of the group make a run for it while Boyle holds off the bad guys. Since he’s been a jerk for the majority of the film, this is his one chance at redemption. Predictably, his martyrdom is made official when he is fatally wounded. A tear-filled and touching good-bye from Cartwright follows. A weakened porthole gives away and the compartment begins to flood. Though a convenient door is found, Knight perishes in the rising waters. Just when Beyond the Poseidon Adventure should be racing towards it’s thrilling climax, the movie comes to a grinding halt as Field takes time out to ask Jones for romantic advice. Jones, Pickens and Malden each share more of their backstories while the romance between Cartwright and Harmon is explored. Caine reveals that the only way out is through an underwater obstacle course. Coincidentally, there’s some scuba gear on hand, so our all-star survivors don masks and tanks for their swim to freedom. Most of the cast makes it to the surface, but complications from Malden’s mysterious ailment leave him at the bottom of the deep blue sea. Though they’ve made it free of the sinking ship, they still have Savalas to contend with. As Savalas and his men load their precious cargo, Caine and Field swim to the tug and ferry the boat closer so the rest of the group can safely escape. Pickens isn’t so lucky and is shot dead. As the tug pulls away, the Poseidon gives a last mighty rumble. The overturned ocean liner (an obvious miniature in a studio tank) along with Savalas, explodes in a giant fireball. This time Caine happily obliges. It seems that diamonds are a tugboat captain’s best friend. In conclusion: In the 1960’s, television producer Irwin Allen entertained millions of viewers with escapist fare like Lost in Space, Land of the Giants and Voyage to the Bottom of the Sea, a series developed from the 1961 film he also produced. With bigger and better projects always in mind, Allen longed to return to the big screen in a big way. He did that in 1972 with The Poseidon Adventure. The film was a phenomenal success and jump-started the disaster movie craze of the 1970’s. Allen continued his box-office winning streak with The Towering Inferno in 1974. The films that followed relied more and more on genre conventions and became increasingly ridiculous. The Swarm (1978) combined an all-star cast with a rampaging horde of killer bees. When Time Ran Out (1980) featured an all-star cast battling Mother Nature and volcanic eruptions in a tropical resort. By the end of the decade, audiences had caught onto the formulaic genre approach to action and had moved on. Beyond the Poseidon Adventure tried to recapture the success of the original, but sank at the box-office. 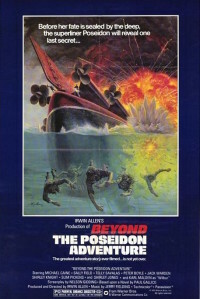 Movie enthusiasts with a taste for the absurd will no doubt revel in this sequel’s clichéd plot devices and colorful art design that seems more influenced by Allen’s TV work than the original Poseidon. Beyond the Poseidon Adventure wouldn’t have been possible if it weren’t for production problems on the original film. As originally scripted, the S.S. Poseidon sank beneath the waves after the original survivors were rescued. A shot of the sinking vessel was created using a miniature, but the final results were so unconvincing that the shot was scrapped. With no time or budget left for new effects work, The Poseidon Adventure ended with a final shot of a rescue chopper airlifting the all-star survivors to safety. Seven years later a new cast would arrive to seek one more adventure on the grand old Poseidon. Part of the fun of Beyond the Poseidon Adventure is watching otherwise respectable actors engage in utterly ridiculous situations. It’s had to believe, but Beyond counts no less than four Academy Award winners in it’s cast! Field and Caine faired the best. After starring in this silly sequel, they each went on to win the best actor and actress award twice!